It was another rushed day at the Chatrapatri Shivaji International Airport (CSIA) in Mumbai. I was running late, as usual. Sprinting past those plush eateries and the super tempting shopping arena. I noticed a burst of colours as I rushed towards my boarding gate. The blurry memory of colours stayed on for a long time. Two months later, as I embarked upon my Doors of India journey, I got a longer glimpse of the artefacts near my boarding gate. I saw intricate doors exhibited in the lower level lobby, their story unknown. On my return from Sharjah, at the arrivals, I was delighted to come across an array of arty installations panelled across the walkators , making me gaze at them infinitely almost forgetting about getting off the walkator in time. But today was different. I walked into the CSIA not as a passenger but as a visitor. A celebration of the gorgeous artefacts, showcasing the culture, art and vibrance of India as a nation to the millions of travellers who enter and exit this airport. Ashwini from the Jaya He GVK team greeted us and explained about the guided tour that can be availed by passengers who depart from the CSIA. This Jaya He Museum Safari can be pre booked on their website and is a boon for transit passengers who are traveling from Mumbai and wish to see timeless India from the eyes of several artists across the country. A vision of Mr. Sanjay Reddy and a confluence of artists, designers , painters, architects, conservators who worked under the guidance of Mr. Rajeev Sethi, a renowned scenographer. We walked past the thematic composition India Greets: where doorways , facades and arches greeted us. Some from Rajasthan, some from Gujarat. Each narrating a story of yesteryears, of the curators who seeked them, of the conservators who refurbished them and of the nation they represented. India greets: welcome to a country of colours! This section had various architectural and sculptural elements that are traditionally features at the thresholds of India homes , like the montage Celestial Realm from Kerala: with traditional brass lamps, terracotta roof shingles and the Kodi ( Mughapu) , the gable that served as signboards. A unique canvas montage caught my eye: Theatrical screening from Maharashtra that pays homage to he dying art of painting sceneries that were once used as backdrops in Maharasthrian theatres. There is also a Fortress of Clay: which pays homage to the rural, rustic households of India made of mud , cow dung and with rice paste motifs. A recycled map of Mumbai made from e-waste, a large assemblage of run down houses evoking a sense of nostalgia and other such artworks made from acrylic, granite, wood and MS steel enthral the visitors with the immense thought behind the creations. Every minute detail I missed as a passenger came to the fore when I saw it on the walk. The intricate Chikankari patterns were imprinted on the tall glass walls of the airport , glimmered as the sun rays passed through them. The ornate chandeliers which always caught my attention , represented the Phulkari work of Punjab. Furniture from Nagaland displayed majestically with stories of the Naga tribes and their traditions. There was a little bit of India present everywhere in a building that seemed so modern and state of the art. The walk was getting more interesting by every installation we visited. Water, Air, Space, Fire, Earth all of these elements known as the Pancha Bhoota were creatively displayed at the India Elemental section. A musical fountain where visitors could pass every spout, yielding a unique sound. Right below it, earthy excavations with see through glass panels, representing the element Earth. A collection of brass Diyas to represent fire succeeeded it. A few steps ahead what looked like a white Rajasthani turban was actually a picturisation of the Iconic Hawa Mahal in Jaipur representing the element Air. Unbelievable but true, the montage is made of Bhutanese paper and Fibre glass. Awestruck, I moved further to find panels with starry elements signifying space. What looked good to the eye certainly had a thought behind! The museum is spread over 3.2 kms and is seamlessly integrated within the airport premises so that the exhibits can be viewed by passengers on their way to the boarding and exit gates. With over 7000 artefacts handpicked from various regions of India, some dating back to the 11th century, the Jaya He museum represents the cultural diversity of India and showcases the traditional skills of artisans and the contemporary thought of modern artists. Thus making it India’s largest public art initiative. With vibrant hues , hanging artefacts, stylish bullock carts and an array of colours, the section India Moves caught my attention. What looked like a palatial Shekhawati haveli ( I was reminded of my recent visit to the region), was actually depicting the several ways India has been moving across centuries. Different forms of transport: from trains, to palanquins to hot air balloons have been painted onto the facade. India Moves: showcasing how India moves! A little further are rustic bullock carts , wooden boats that pay tribute to India’s maritime history, flying locomotives and royal carriages. The Jaya He Museum has initiated not just an exhibition of India’s rich cultural heritage but also showcased rural art and encouraged artists by giving them a platform to showcase their work to the lakhs of passengers passing through the CSIA. Like any project this one faced hurdles too. The challenges were to procure and transport these artefacts to Mumbai, built them seamlessly in a way that it doesn’t obstruct passenger movement, some were extremely delicate like Charmi Shah’s installation. Artists worked on such a magnitude for the first time and here is where engineering met art. It came in pieces. Broken, in a way that it required immense restoration. A team worked on getting the painting together, fitting pieces like a jigsaw puzzle. When one looks closely , fine lines can be seen where the pieces were joined meticulously. The 1932 painting stands proudly making visitors awestruck. While the installation Moving constant transports you to Tanjore with it’s ornate paintings and vibrant figurines, the colourful Durga forms from the east are a treat to the eyes! Each exhibit here tells a story. We may not know their exact origin, we may not know the secrets they behold, we may not know how many hands have touched them before ours, we may not know their past owners, but we know they capture the essence of Indianess and are symbolic of the warm hospitality of India. The Jaya He Safari can be pre booked by any passenger departing from T2 of CSIA. It is a free guided tour depending on the time at hand and the area of boarding. Probably the best way to kill time at an airport! Free of Cost! Most installations have placards describing the installation, the artist behind it, the region an artefact was procured from and how old the artefact is. There is also a Jaya He shop present in the airport, where art connoisseurs can pick up products make by local artists and help them earn while appreciating their skills! The maintenance and upkeep of the museum is a very tough task in the busy CSIA. It is our duty to not unnecessarily touch the artworks and damage them. I am so happy reading this, because one day they’ll do the same in Delhi airport also. There are already a few displays there (saw them on my tour in Oct-Nov last). Good to see these artworks greeting passengers in Mumbai. I am sure the foreigners would be especially happy…they’ll get what India can offer beyond their itinerary. Such fascinating installations and beautifully captured pictures, Divyakshi! 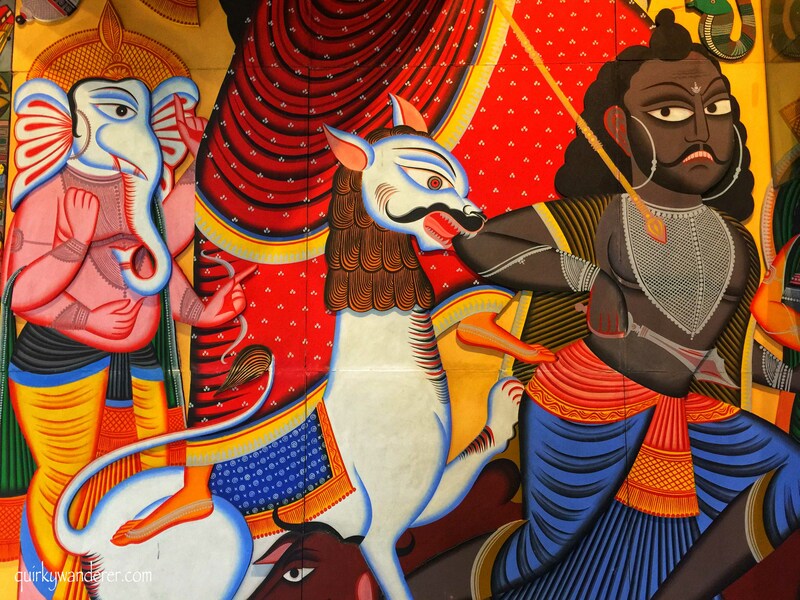 I really like the idea behind setting up this museum for passengers to give them a glimpse of Indian art and culture through paintings, murals etc. Just wanted to check that how much time does it take to cover the whole museum as you have mentioned it’s spread over 3 kms and also if there are any open and close timings? This is a work brilliance,passion and craftsmanship(woman ship) that evokes Indianness in every sense! Glad I got to see this through your lens,Divsi. I cannot believe this is in the airport! It is such a fantastic idea and an amazing way to pass the time during long layovers but I still can’t believe there’s such an elaborate and well curated museum inside an airport! Wow! It’s been over a decade since I visited India so I’m long overdue on a return trip. Whenever that happens I’ll DEFINITELY be visiting the Jaya He Museum! I absolutely love the idea of having a museum inside an airport! It will really help kill time for all the travelers waiting for their flights! I’ll have to remember this if I’m ever in the Mumbai airport! What an a amazing opportunity, the colours if the artwork as so vibrant. I love the idea of a museum in an airport, so many times you are sitting waiting in airports for hours on end with nothing to do. I was just penning down a post on what to do at Singapore airport and was thinking how we do not have any such thing at our Indian Airports, and lo and behold I come across this interesting museum in our very own Mumbai museum. The museum is interesting and the theme of art from each state is wonderful. I have been there lot of times but never thought that there can be a museum. Next time will definitely visit there. This is so beautiful! I love all of it, especially the recycled map of Mumbai. That sounds like such a cool tour, and I love that whoever designed the airport put so much thought into making it beautiful. So many airports are just whitewashed concrete! Oh nice! Airports nowadays are full of shopping and overexercise cafeterias. What a fantastic idea to put a museum there. And quite an interesting one! Wow, what an amazing find in the Mumbai airport of all places. The JAYA HE GVK MUSEUM looks amazing with all the beautiful artwork. I dont know what I love more, all the colors you found in the art or all the intricate carving and latice work. It is always amazing the art people can envision and then create with their hands. This is in an airport?!!?! I want to now make sure we schedule a long layover or time to explore the museum while we are in Mumbai! I really like the recycled map and really all your photos showcase the cool exhibits inside! Can’t wait to experience this in person one day. Wow! Great to know that there is a guided tour too! Shall surely book myself on one next time I travel through here. Thank you for sharing. Wow! This airport looks like a true work of art! You have to be careful not to miss your flight at this baby! Aaamchi Mumbai! …as they say locally. It’s such an honour that in the tightness of space in the bustling city, finally GVK has done us proud. I travel often in and out and really enjoy the Artwork. But look at it as a museum..I did not. Thanks. Connecting from Goa, I end up spending a lot of time at CSIA Mumbai. Every time I look at some of the museum displays and every time I tweet to CSIA to have a guided tour, I did not know they have launched a guided tour. I am sure going to take it next time I am passing by Mumbai. Wonderful initiative at the Mumbai airport. I may be in the city in March and will be sure to check out this museum. A guided tour sounds perfect, I think its a good idea to do that. That is so awesome that this is in the airport! Thank you for sharing, I hope to visit it myself one day! This is such a wonderful idea to have a museum integrated within the airport. I would love to view exhibits instead of plain white walls. Would probably make the airport experience so much better! The Jaya He Museum looks really fascinating. It seems different corners of India have been merged into a single, colourful and mind-boggling mosaic in the museum. Hope to be able to spend some time here on my next visit to Mumbai. I did not even know about this. (It probably has to do with my general dislike for air travel). But in any case, great to know that something like this has been thought of and implemented by the authorities. I visit the museum first whenever I visit a new town. This helps me get ideas about what I need to see in the area. Similarly, people flying into India can also get a better idea about the country. I vaguely remember this from my visit but didn’t appreciate how stunning some of the stuff was. How awesome. What an amazing idea! I frequently have long layovers, and it would be so perfect to explore culture while waiting for my flight. Their collection is truly stunning, and I love that they’re working to source things from rural artists. Thanks for sharing! How cool is that that they have a museum in their airport in Mumbai. Jaya He looks really fascinated. I’d love to get to explore it – especially since there are free tours – when I fly through Mumbai! The artwork of Mumbai airport is lovely. I remember running for my vistara flight and cursing myself for being late coz I didn’t click anything. They had a similar setup at IGAI Delhi but it was temporary. I really enjoyed this post! especially have been to that airport twice before. Some of those pieces are exquisite and are fascinating showing true India. What an absolute feast for the eyes! I’m fascinated by architecture, so that part of your post particularly stood out for me. I love how there is so much detail and intricacy; it’s so very beautiful. Such fortune to enjoy a guided tour of such an incredibly beautiful space! I think we underestimate the ability of airports to be a place to learn or have an experience such as this. Not only is this an inspiring way to pass time, it is such a wonderful education and a chance to indulge in such intricate and passionate works. I’d love to take this in if we ever get the chance! Wow! So colorful and picturesque museum. The airport seem to be the right place for these ilustrations considering how much time is spent there. Wow – I’d love to visit this museum and will make sure I do if I’m going through (or to) Mumbai! I love how it mixes architecture, heritage and art – it’s all so beautiful but I particularly like the India Moves exhibits. I love this! Some airports really offer amazing artwork and this seems like such a cool experience. Thanks for sharing! A museum in an airport sounds like a great idea. I would prefer to walk around this than the same shops that are in every airport! The colours of the artwork here look amazing. I hope more airports follow suit. I can’t believe this is the airport! I was reading it just lost in the art and history and description only to have the slap back to reality that this is in an airport. Now I’m kicking myself for forgoing a 5-hour layover in Mumbai for a trip next month! You need to book a Jaya He safari on their website if you have a air ticket and you are flying From this terminal.